Can it be Friday already? I’m told it is: Friday, November 16, 2018, and National Fast Food Day. It’s also Icelandic language Day, which coincides with the birthday of the Icelandic poet Jónas Hallgrímsson. Can you say a single word of Icelandic? I can’t, and that’s sad. So here’s one I found, and an easy one: “Hello” is “Halló”, pronounced “Hall-oh”. On this day in 1532, after conquering Cuzco on the previous day, Francisco Pizarro and his men captured the Inca emperor Atahualpa. The emperor was imprisoned, and to save his life offered, according to Wikipedia, “to fill a large room about 22 feet (6.7 m) long and 17 feet (5.2 m) wide up to a height of 8 feet (2.4 m) once with gold and twice with silver within two months.” Then he’d give it to the Spanish. That’s a lot of dosh, but it never happened: the Spanish sentenced Atahualpa to death and (after converting to Christianity so he wouldn’t be burned at the stake) he was strangled on July 26, 1553. On November 16, 1849, Fyodor Dostoyevsky was sentenced to death by the Russian government for subversive activities. There was a mock execution, in which he and other were lined up before a firing squad, but at the last minute a reprieve came, and Fyodor served four years in a Siberian prison camp. On this day in 1855, David Livingston became the first European to see Victoria Falls. In 1938, Albert Hoffmann first synthesized LSD from ergotamine at the Sandoz labs in Basel. As a graduate student at Harvard, I heard Hoffmann, as a guest lecturer in Richard Schultes’s economic botany class, tell the story of how he did this . Far from being a weirdo, Hoffmann was a staid European scientist lecturing in a white lab coat! On this day in 1940, the Nazis closed off the Warsaw Ghetto. On November 16, 1988, Pakistani voters elected Benazir Bhutto as their Prime Minister; this was the first open election in more than a decade. Notables born on this day include W. C. Handy (1873), Paul Hindemith (1895), Oswald Mosley (1896), José Saramago (1922), and Maggie Gyllenhaal (1977). Only a handful of notables died on November 16: Sam Rayburn (1961) and Milton Friedman (2006). 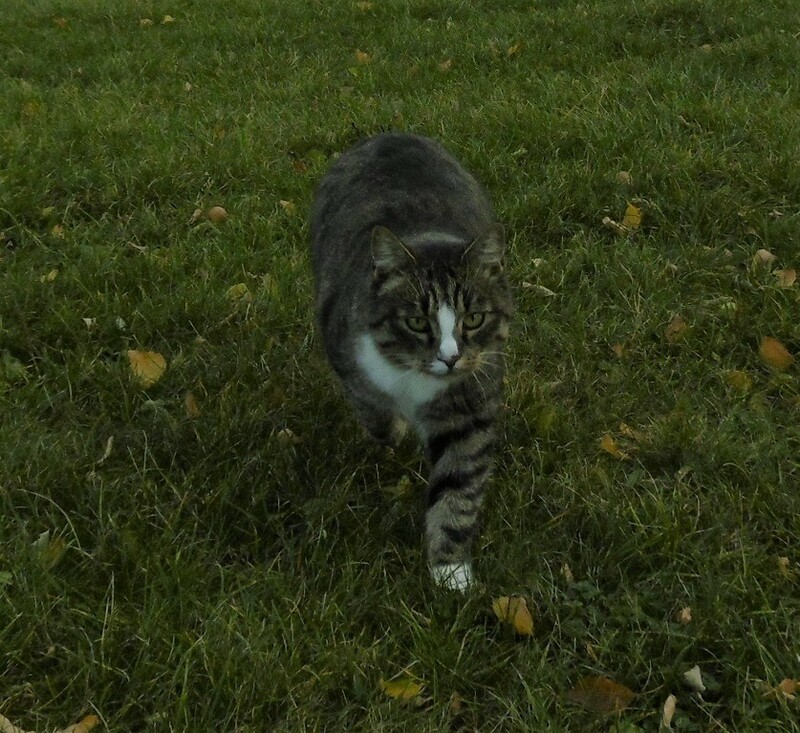 Hili: I’m going for a night hunt. A: Be careful not to be hunted yourself. Hili: Idę na nocne łowy. Ja: Uważaj, żeby ciebie nie upolowali. Tweets from Grania. Notice the beauty of this Bengal kitten. The tragic thing is that I could have one like this any time I want (I have an offer from a wonderful breeder), but I travel too much. LOOK AT THAT SPOTTED TUMMY! Movements of setae at the distal end of the parapodium in a stolon of syllid polychaete. Plankton from Bay of Santander. Explanation #1: Gouldian Finch chicks have blue phosphorescent beads along their mouths, making it easier for their parents to feed them in their dark nests. This entry was written by whyevolutionistrue and posted on November 16, 2018 at 6:30 am and filed under Hili Dialogue. Bookmark the permalink. Follow any comments here with the RSS feed for this post. Both comments and trackbacks are currently closed. Daniel Tammett learned Icelandic in something like a week – he’s a high-functioning savant. wow! I spent more time on Old Norse… & at one time I could read Icelandic reasonably poorly, but much has faded in the last 17 years! Í holu í jörðini bjó Hobbi. I also have an Icelandic translation of the Bible (which I have not read in its entirety – it’s bad enough in English), but most of my books are in Old Norse, not the modern language, which has not changed much. It’s as if present-day English speakers could read Beowulf with no more difficulty than they can read Shakespeare. If a tenth-century viking, like Eystein Fret* sailed through a wormhole and ended up in Reykjavík harbor, he’d have an odd accent but he could speak and be understood. Iceland is the only Nordic country that still uses the matronymic/patronymic system instead of family names, and names are declined grammatically as with any other noun. *Eystein Fret means “Eystein the Foul-Farted” and is recorded as being one of the original settlers of Iceland. I feel sorry for his family. I had a cat I named Freti, which roughly means “Little Foul-Fart”. Though I wouldn’t care to bet on my pronunciation. Remember all the newsreaders in 2010 struggling with it? Oh right I practiced that one too!… not the spelling though, that’s damn good. As a graduate student at Harvard, I heard Hoffmann, as a guest lecturer in Richard Schultes’s economic botany class, tell the story of how he did this. I’m guessing this was, what, about a decade or so after the contretemps at Harvard involving Alpert and Leary (based, in part, on their experimenting with psychedelics)? Sorry for the double. Blame it on the coffee. Sorry, the context might not be easy to find on that. Feb 16 is the date you gave for Milli Vanilli giving their Grammy back. Yeah, it’s all November and the dates are right. Somehow I put some “Februarys” in. Fixed. I don’t know a word of Icelandic but I do know one word of Norwegian: Takk (thank you). I’ve also been to Hell. There’s a mouthful for ya — and I ain’t talkin’ worms. The phosphorescent bird mouth rim fact is amazing. I spent a year in Iceland ’98-’99, and wasn’t able to learn to speak the language at all. My tongue just couldn’t get around the sounds you have to make. And, although I speak and read French pretty well, it was not a help at all. There is one custom that they have that I thought was the sweetest thing. When you are invited to someone’s home for dinner or a visit, the next time those people see you they say “Thanks for the last time”. In other words, they are thanking YOU for coming to their home and spending time with them. That just struck me as adorable and kind. José Saramago: one of my favourite writers. That American History thread was great. I wish we’d studied that version when I was in school. That should be a required text in American history classes. It’s great. I have a similar little book, can’t recall how it came into my possession or when it was published. It’s a diatribe against Chiang-Kai-Shek, apparently full of obscenities, very scatalogical, with a lot of drawings of him farting ghosts. I thought it was Chinese, but it’s the same sort of book, similar drawing style, but it may be Japanese, and perhaps could be about the Sino=Japanese War. I’m going to photograph it and send the photos to Nick Kapur to see if he can tell me something about this curious little book. How could I have misspelled scatological? It’s one of my most used words. And yet another feline art failure! I somehow expected the Japanese artists to manage a better tiger than that! Wow, jingoism for someone else’s country! I was in a meeting last Friday that has an ASL interpreter, and I had to stop looking at her because her emoting was going to make me crack-up. That poor cat looked just about drowned. What a way to go. Slobbered to death by affectionate pups. I almost feel sorry for Milli Vanilli. When the needle gets stuck in the groove (is that even possible with modern technology? I guess it is, if the digital starts auto-repeating itself), there is absolutely nothing the poor sod up front can do to save the situation. At least, if the playback stops abruptly, you can always just pretend that your mike has died on you. Prof. Coyne, after you found a volunteer to feed the ducks while you were away, maybe there will be a kind soul to feed you prospective Bengal cat as well! These chick beaks look absolutely like orchid flowers, I wonder whether some insects go inside on their own.